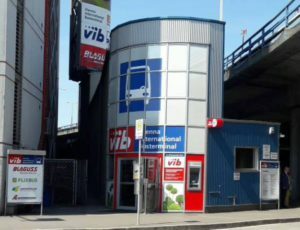 The place of boarding in Vienna, AT – Vienna International Busterminal, VIB “ERDBERG”, address Erdbergstraße 200, A-1030, Wien, Austria, platform for international routes. The GPS coordinate: 48.190882, 16.414022. On the platform please wait the comfortable coach with label “Vienna-Budapest-Chop-Uzhgorod” on the windscreen. 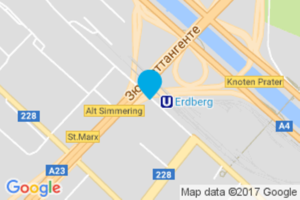 The VIB is located in the 3rd district of Vienna and is – by taking the U3-underground (station “Erdberg”, orange line) which is located opposite – only 7 minutes away from Vienna City Center (station “Stephansplatz”). The departure points of the coaches are displayed on three display panels (PLATFORM “C”). The stops “1-20″ are located in the interior of the bus terminal, the bus stops “A-D” just a few meters from the main building directly on the Erdbergstraße. Furthermore the cheap airport-shuttle “Air-Liner” offers a perfect and convenient connection between the VIB- Vienna International Busterminal/Viennese subway and Vienna Airport. The trip about 30 minutes. On the route Uzhgorod-Chop-Vienna the eproximatly time of arrival to Vienna – 19:00. On the reverse route Vienna-Chop-Uzhgorod the time of departure from Vienna – 07:30. In the current section and everywhere on the web-site indicated the Central European time on the territory of Hungary and Austria and Kiev-time on the territory of Ukraine. The delay is possible during the crossing of the border as in Budapest-Vienna direction as in Chop-Uzhgorod direction, also. Due to the above, our company can not guarantee the 100% keeping of the timetable. Please, take into account this information during planning of your trip and others transfers.